For dogs, summer can be the best time of the year with pool and beach days, extra-long evening walks, increased outside time, and more! On the other hand, summer is also filled with crashing thunderstorms, ear-splitting fireworks, endless outdoor construction, packed family parties, and extended family vacations. These events can be stressful for some dogs, and Cosequin Calm Chewables are perfect to help keep them calm and relaxed. Noise and separation anxieties are common sources of anxiety in dogs. 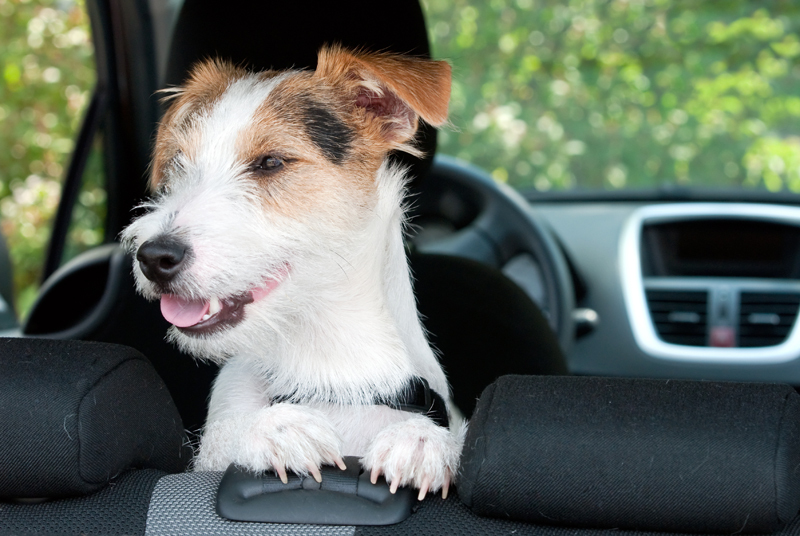 A less common source of your pet’s distress is actually taking them with you on your summer road trip. Taking your dog out of its bubble of your home and neighborhood can be stressful for both you and your dog. When traveling with your beloved pup, it’s important to remember to keep them comfortable and safe throughout the trip. Introduce the car– If your dog isn’t used to being in the car, spend a few days to a couple weeks, prior to the trip, getting him used to the car with short car rides and plenty of rewards. Identification– Make sure your dog is wearing a collar with updated tags in case of an emergency. If they have a microchip, update that information as well. Check with the vet– Take your pup in to make sure all vaccinations are up-to-date, and bring the records along on the trip. For an extra cushion of safety, compile a list of emergency vet clinics that will be nearby on your trip. Tire them out– Before heading out, give your pup a good exercise session to tire them out and put them in a relaxed state. Well-exercised dogs have less pent up energy that can be translated to heightened feelings of anxiety. Keep calm and give your pup a calming supplement– If your pet needs that extra “oomph”, give your pet a yummy Cosequin Calm Chewable, which contains calming extracts that help balance your pet’s mood and keep them calm as a clam. Take plenty of pit stops– Give your dog plenty of water and take many pit stops so your pup can potty and stretch its legs to release any energy. Reminder– Never, ever leave your dog in the car alone, especially in the summer! Cosequin Calm makes traveling with your pet a breeze! Cosequin Calm Chewables help your pet cope with the stressors of traveling. It’s also great for dogs that suffer from noise and separation anxiety. Cosequin Calm is perfect to give to dogs prior to thunderstorms, firework shows, family parties, or any other upsetting experiences. This tasty chewable contains calming ingredients like Magnolia Officinalis and Phellodendron amurense extracts, L-Theanine, and dried Whey Protein Concentrate, which helps settle your dog’s anxiety during stressful situations. Give Cosequin Calm to your dog daily to help manage their general anxiety, or just keep it handy when your dog needs a little extra help to relax. Win FREE Cosequin Calm for your dog!! Is summer a hard time for your dog’s anxieties? 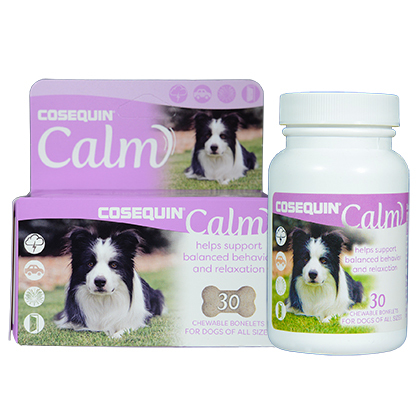 Cosequin Calm Chewables are a perfect solution to ease your dog’s nerves! Just leave a comment below and you could win FREE bottle of Cosequin Calm from 1800PetMeds! Twelve (12) winners will be chosen at random on Thursday, July 19, 2018, so everyone who participates has a chance to win! (Limited to residents of the U.S.) Good luck! Congrats to the drawing winners! Look for an email from us about claiming your prize. ← How your dog sees the world: are dogs colorblind? My Cujo hates storms. He pants and shakes until the storms past. I would love to have something to come him down. The Thundershirt doesn’t work for him. My dog sparky needs this. He gets nervous for many things like thunder storms or fireworks, and other things. Would love to try for my fur baby who is bothered by thunderstorms. My poor Kirby was so disturbed by fireworks that he put his front feet and head through the dog door while the back half peed in the kitchen!! This would be great for my Chihuahua/Pug mix, Jaxson! He hardly tolerates getting his nails trimmed, so I have to take him to our vet to get it done. (Very expensive!) Jaxson and I would love to try this. My Chihuahua/Pug mix Jaxson and I would love to try this! He has to go to the vet to get his nails trimmed as he is very afraid of getting it done and too full of anxiety for me to do it. But maybe we can try the Cosequin Calm and see if we can do his nails at home, as the vet is so expensive! When 4th of July comes, Cosequin Calm comes in handy. Perfect for summer thunder booms! We have a road trip coming up in August, and Liv will be meeting new furcousins so this would be perfect, as she also has Addison’s disease! My rescue dog from Afghanistan has anxiety issues. I would love to have my dog be calm when I leave the house. I have two older dogs (10 year old lab and 14 year old cocker spaniel). They both get anxious when we have company at the house and thunder storms terrify our lab. She gets so upset during thunder storms that she actually will have an accident in the house.This medication sounds perfect. It would be perfect to help them calm down when they get anxious! Thank you! My Boston Terrier gets so worked up in the car that I have had to pull over because I am afraid he is going to have a heart attack. He also shakes so bad when we attend a family gathering that he probably loses 2 pounds. I feel horrible when I put him in these situations. This product sounds like it was made for him!! My dog is extremely anxious on car rides. I dread having to take him anywhere, but like taking him with me. My poor Carly is still suffering with the fireworks antics in our neighborhood ongoing after the Holiday. We would love to test this out….between summer festivities (fireworks) and constant thunderstorms in Florida, our 6 pups would appreciate! My dog, Crickiesue, is afraid of riding in cars. I got her from a puppymill when she was two years old and don’t know if her fear stems from never riding in a car until I got her or what. I would love to try your Calm formula to see if it works. Thank you in advance. I would love to try Cosequin Calm for my dog, Crickiesue, who is afraid of riding in automobiles. Thank you in advance. THIS WOULD BE GREAT WHEN WE GO ON A TRIP AND HE HAS TO FLY IN A KENNEL. my dog is terified of thunder, lightning and fireworks . thunder blanket used to work and last week’s fireworks caused her to climb in bathtub to hide.